Get your straw at the ready because THIS is The BEST Salsa Recipe! Sure I love Pico de Gallo, trust me when I say I eat it with a fork for lunch some days (just ask the employees of the Mexican stand at my farmers market, what I eat for lunch most Thursdays, lol), however this salsa?? This salsa I can drink with a straw. I haven’t…yet, I literally think about doing just that! My friend Molly makes a killer salsa and after having hers a couple of times, I decided to make something similar. I started with a can of fire roasted tomatoes that I was staring at one day in my supermarket and took it from there. I added some of this and some of that until I achieved the taste that I crave. Now you may find it odd to add honey to salsa, however, most people add sugar to their homemade tomato sauce (I know I do). The sugar helps cut the acidity of tomatoes. Remember tomatoes are a fruit. So sweetness is a part of what a perfect in-season tomato should taste like. 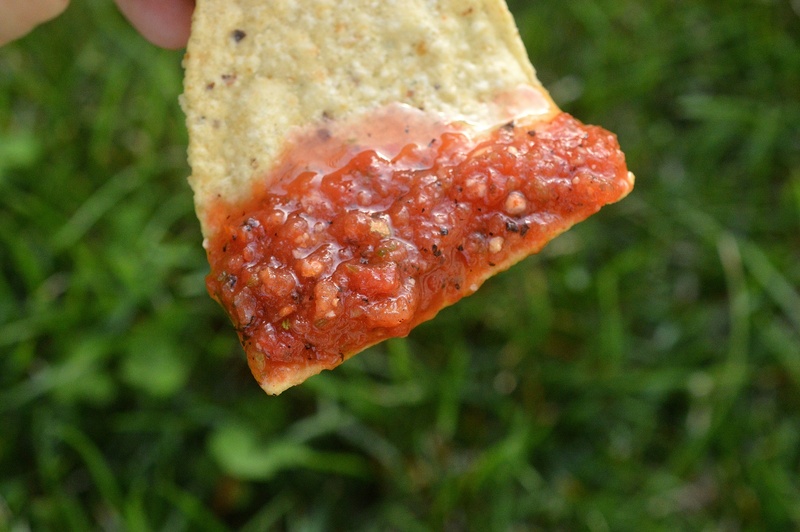 Adding some honey to this recipe for The BEST Salsa Recipe is part of what makes it earn the title in my opinion….and makes it straw-worthy…Mmmmmm! Besides being delicious, “The BEST Salsa Recipe” is so, so easy to make, literally throw everything in your blender, Vitamix, Ninja or food processor and tah-dah! All you need to do after that is taste and adjust the flavors to your preference for sweetness and/or heat and grab a straw…err I mean chip! It also makes a great food or hostess gift! Why canned tomatoes? Quality canned tomatoes are picked at their peak and stay that way. If you can find fire roasted tomatoes awesome…if not this will still be delicious! You can always use the bounty from your garden in place of canned…that works as well! 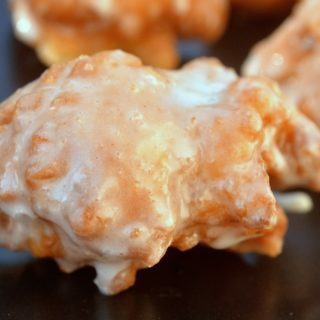 This is one of those delicious yet easy recipes that you can let your kid(s) take the lead on. It’s also in my cookbook for tweens and teens who enjoy cooking. 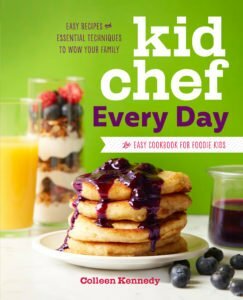 66 recipes that anyone in your home would enjoy and your kids would feel so proud of making. When kids contribute to the family by way of preparing meals…They feel empowered, confident, learn so many lessons from planning to organization to follow through AND they get another notch on their belt in becoming a confident home cook! An all-around win! Check out the book…Just click on the photo! 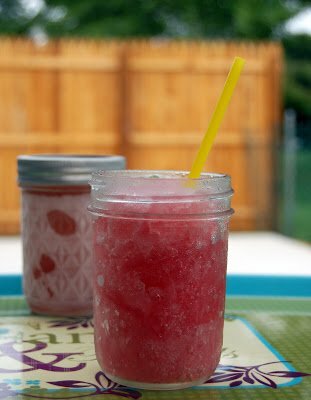 My Make Ahead frozen Chambord Margaritas would go well with this salsa. Keep these in your freezer until the mood strikes or someone pops over…Instant party! Love Avocados as much as I do? 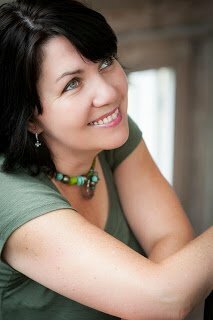 I have a ton of avocado recipe…take a look HERE. If you are a Mexican food fan (after all today IS Cinco de Mayo). This is dish incredible and different! 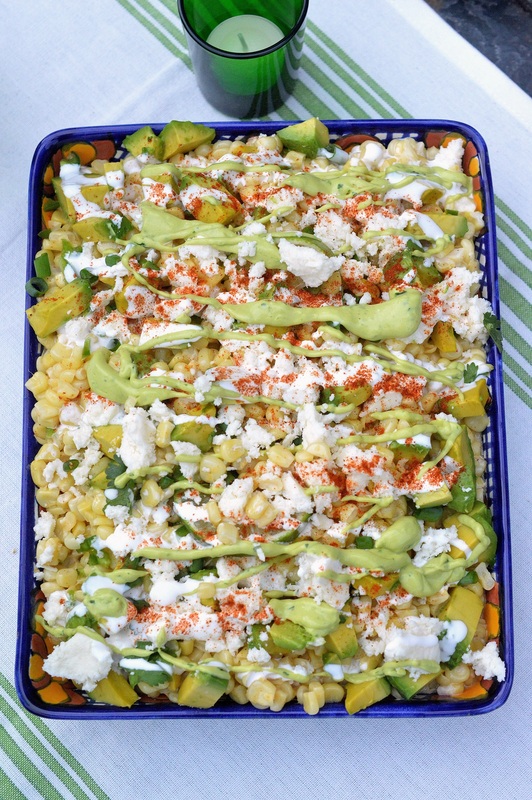 My Mexican Street Corn Salad is a must make! 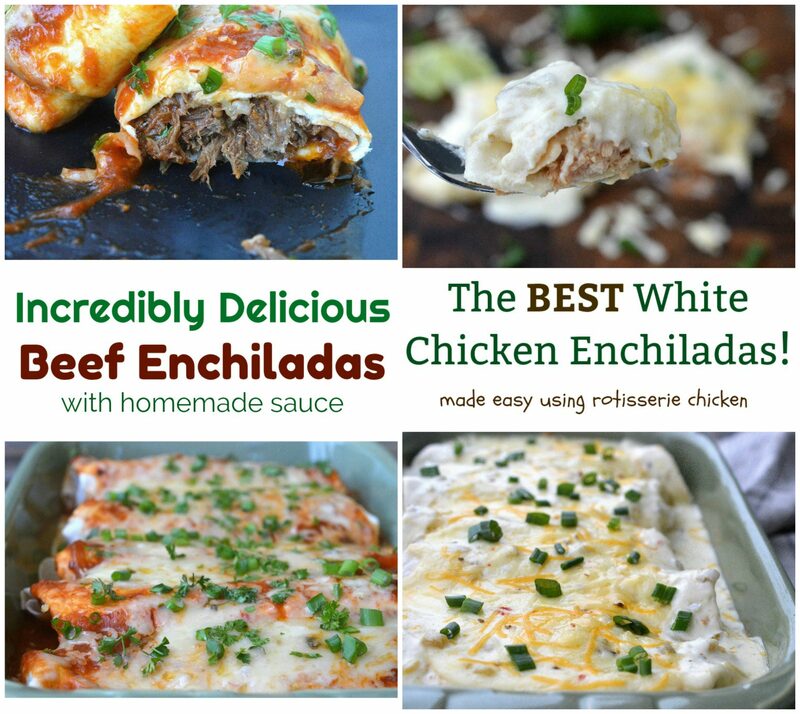 And if you enjoy Beef Enchiladas or White Chicken Enchiladas…I have them for you two and they are 2 of my favorite recipes. The honestly are better tasting than just about every enchilada I have had out. I kept working at each recipe over the years till I got them right. I do hope you try one of these and enjoy! Tag me on Instagram or Facebook @SouffleBombay or #soufflebombay when you make one of these Mexican -inspired recipes, I would love to see your creations!! I don't enjoy onion in this, however, if you do feel free to add in 2-3 TBS chopped red onion. 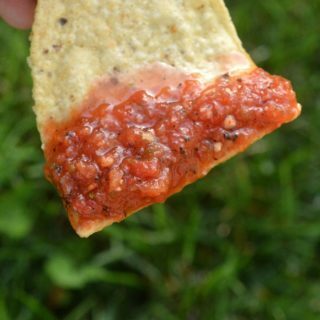 I make a salsa very similar to this using canned tomatoes as well, but I also add well drained crushed pineapple to the mix, very refreshing! What a GREAT idea Dolores, sounds extra refreshing! We keep our salsa in the fridge for up to 2 weeks. Not very long. It’s so good that ours is gone very quickly! Haha! I agree!! But I have kept in as long as 10 days and it was delicious still (maybe it stays good because I don’t typically add onions). I have enjoyed it as long as 10 days after making it and it was good. I have a question regarding the jalapeños. My kids and I don’t really like “heat” but my husband does. DO you have any suggestions.? please and thank you. Great idea Joe…Love a stuffed poblano! Hi Ali, Why not make a batch, then segment a portion for your husband and in that portion include a minced jalapeno (you can do 1/2 a jalapeno by hand). That or some cayenne pepper will give it a nice kick. If you have a Trader Joe’s nearby, you could use the Sweet Hot pickled jalapeno’s, just remove the seeds. They are delicious and, in a pinch, they work in salsa if you don’t have fresh peppers. No onion? I don’t think I have ever seen a tomato salsa without onions. Could you can this selsa ? To have winter months ! I don’t know a thing about canning, sorry!! I defer to an expert. Yes u can can any salsa to store up for winter just make sure it’s really very hot, have your hot jars ready to fill, hot flats and rings, then water bath for ten minutes, keep check that flats seal, store in cool area. Dried onion flakes work too. I add salt-free chicken bullion to mine and mix it in by simmering some of the salsa to dissolve. 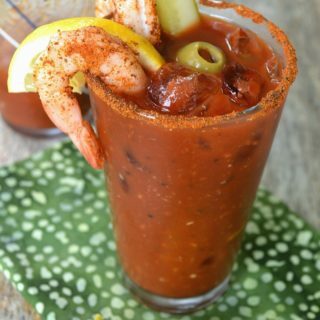 A Serrano pepper will add more zing for those initiated into Southwest culture. Mix all together in blender. Thanks! Adding the Taco seasoning is smart! Does this salsa have to be refrigerated? 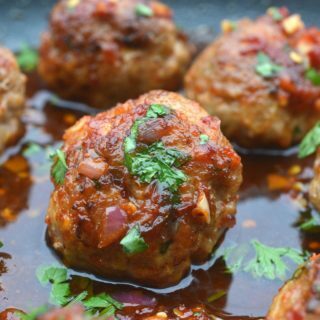 I just made this recipe and found the cilantro very over powering. So much so that it’s not very enjoyable. Next time I think I will just add a tiny bit of cilantro and drain the tomatoes before blending because I also found it to be very runny.